The 15-year gilt yields have reduced towards the end of the month after uncertainty following terror attacks and poor US home sales data. The 15-year gilt yields decreased to 1.62% lower by 17 basis points for the month. 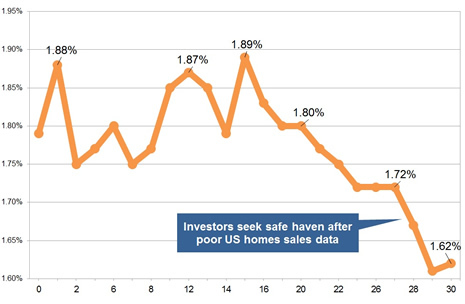 With uncertainty in December investors moved to the safety of treasury notes, gilts and bonds following the terror attacks including the death of the Russian envoy is killed and data for US home sales showed a 2.5% fall in November. Standard providers increase rates by an average of 1.02% and we would expect in the short term rates may decrease by 2.72%. For smoker and enhanced annuity providers increased their rates by an average of 0.30% on average and in the short term rates may decrease by 2.00%. 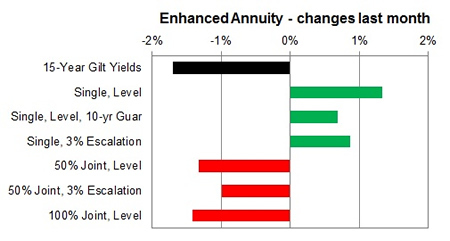 For the month of December 54% of annuity rates increased by up to 5.9% with 10% remaining unchanged and 36% decreasing. 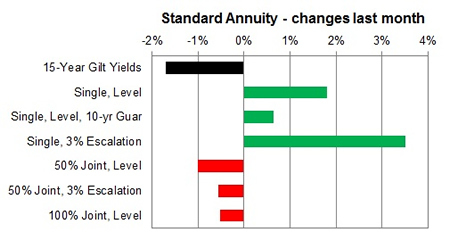 Standard annuities increased by an average of 1.02% during the month. 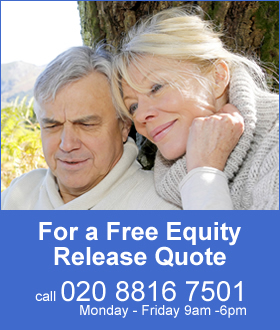 For those aged 65 to 75 rates were higher by up to 5.9% on a single 3% escalating basis and 7.6%. For enhanced and smoker providers rates increased by an average of 0.30% with a larger rise of 3.0% for those aged 65 buying single life, level annuity. The highest decrease was for those aged 55 with single life 10 year guarantees reducing by 2.1%.